8-hour tomatoes . . .
3 hours so far in the oven . . . . Eight Hour Tomatoes . . . Looking through one of the “Kinfolk” volumes, I came across a recipe for cooking tomatoes meant for “darn good sandwiches.” I have a few of the Kinfolk volumes and while some might view them as precious in the way that photographs are taken and articles written, it’s that very earnestness that wins me over. I love looking at them. Anyhow, these sandwiches were composed (that’s the only word for it) of grilled/toasted hearty peasant bread brushed with olive oil and toasted on a heated grill pan until dark striations appeared on the toast. The inside ingredients included thick slices of cooked bacon and a fried egg, frisee lettuce coated in ranchy dressing and these 8-hour tomatoes. My idea was to modify the sandwich recipe a bit, using Dietz and Watson thick-sliced turkey bacon which I already have for my breakfasts, no egg (too gooey) and lettuces instead of frisee. Have the creme fraiche vinaigrette that I used last night to dress the lettuce. As the acid content from tomatoes can sometimes result in disagreeable reactions (mouth canker sores, for example) I thought that cooking them this way might reduce that troublesome aspect. Even if it doesn’t, with the August surfeit of luscious tomatoes approaching at local farm stands, this recipe’s an experiment worth trying. 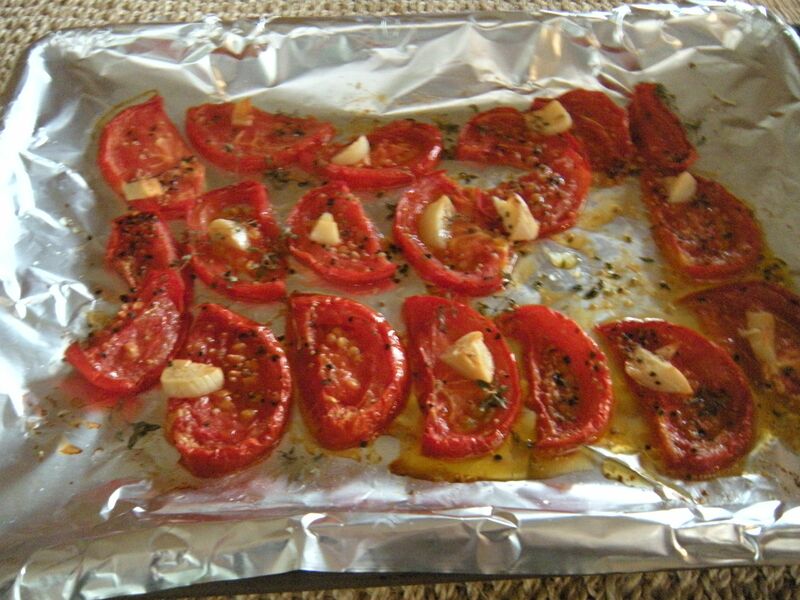 Leftover tomatoes are stored in a layer of olive oil and taken out when needed. Preparation: use a fresh, ripe home grown or farm fresh tomato. Slice in half and then each half into 1/4 inch slices. Brush with olive oil. Cut up fresh garlic into bits and sprinkle on the tomatoes, along with sea salt and coarse pepper. Pick some fresh sprigs of thyme and strip the leaves, sprinkling them on the tomatoes. 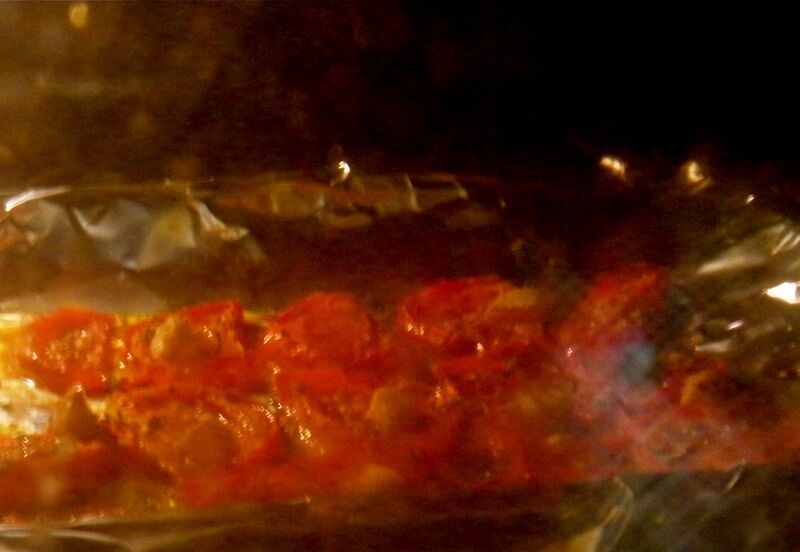 Heat the oven to 400 degrees and roast the tomatoes for ten minutes. Turn the oven off and without opening the door, leave the tomatoes in the oven for eight hours. Refrain from peeking at them with the door open. Yep, that’s right. At first I thought I would make them overnight. But, on second thought, waited until the morning because when the eight hours are up, it’ll be time for supper. Tonight’s supper will be filet of sole with meyer lemon, the rest of the patty pan squash that we had last night and these tomatoes. And for lunch sometime, how about spreading whole-milk ricotta on grilled bread with tomatoes, coarse pepper and fresh basil on top? Postscript: We ate these tomatoes along with the sole and summer squash. They were flavorful from the garlic and the thyme, but the most memorable taste was a deep sweetness emanating from the tomato flesh itself. I think it’s from curing in the heated oven after it was turned off. Will definitely make again with bigger tomatoes – for that fresh ricotta on grilled bread sandwich on my wishlist!